Trays Made Of TetraPak? This Brand Does It! Vrtta designs simple, cute, and practical home decor with a dash of kitsch owing to the myriad of colours in the Tetra Paks recycled to make them. Food packaging is one of the biggest contributors to our growing garbage problem, and luckily Vrtta is slowly trying to make the best of it. Using Tetra Pak boards (used to make packaging for milk and juice mostly) recycled and reclaimed wood, the designer duo is transforming it into small home decor products. 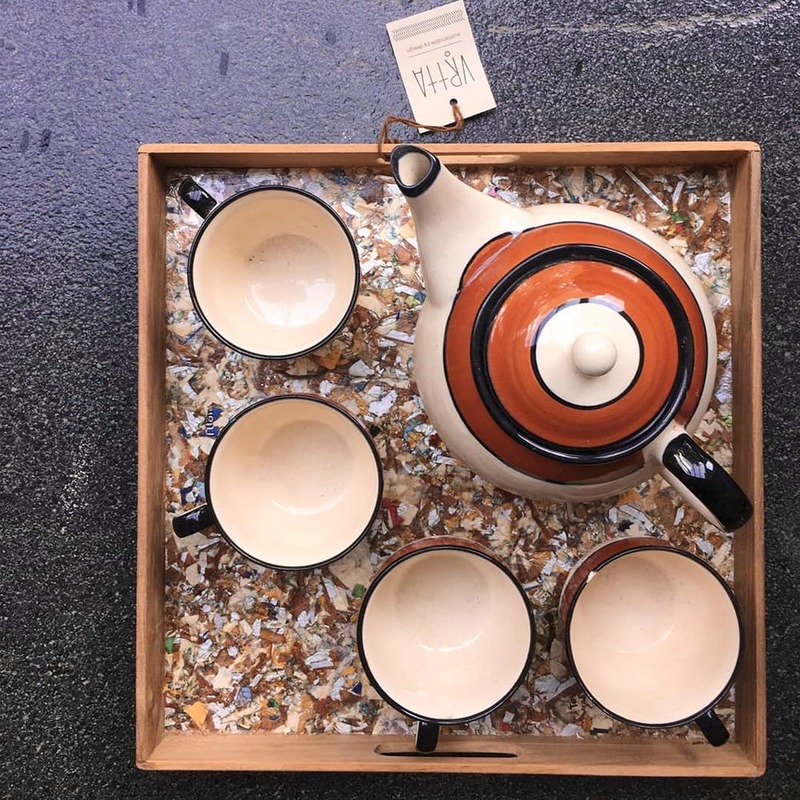 Believing in mindful living their products include serving and slotted trays, shelves, storage boxes, coasters, planters and reusable cloth bags. Keeping it simple and reasonable (between INR 150 and INR 1,100), the products are colourful and artsy courtesy the iridescence of shredded and compressed pieces of Tetra Pak to add a bit of kitsch to them. While most are simple, square or rectangle shaped, the rope suspended shelf (INR 850) is suspended by sisal rope (like jute, but more durable), which works great as a mini bookshelf, terrarium and succulent holder, or spice rack. Multiway holders - solid square frames with holes in it to store anything from pencils and cutlery to salt and pepper shakers, or small sauce bottles. Minimal, multi-purpose, and pretty at INR 300? Give us three! Drawstring cloth bags (for shopping, storage, and even laundry) are available as a set of four for INR 300 with one, two, five, and seven-kilo capacity. No, this isn't made of Tetra Pak board, or wood, but can be used repeatedly, and stop that one plastic bag in your kitchen closet with more plastic bags in it from growing! Bulk orders are cheaper than single orders, so be prepared to shell out, or buy gifts for everyone you know. They take custom and bulk orders, as long as its sustainable and practically possible with the resources that they have.